Like most geeky users of Flickr I started hyper-ventilating with excitement when they introduced their new geo-mapping feature, then was crushingly disappointed by the quality of the maps, then gradually settled down into thinking that the service is pretty OK. What interests me now is the kind of geotagging etiquette that will develop in the service, and how people make their decisions about where exactly to place their photos. Some things have been easy for me. 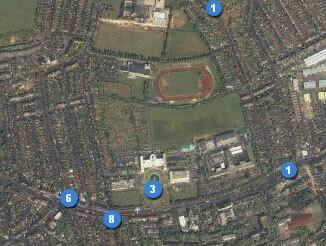 The map coverage of Walthamstow is relatively well detailed for a Yahoo! map of somewhere outside the USA, and with my knowledge of the area I can probably pin-point the location of all my photos of Walthamstow down to the nearest square metre. Even if the map is so out of date that it features the old Walthamstow Central bus station. Other places have been less easy. My new home of Chania is nowhere near as detailed, and you really can't zoom in very far before the map image completely greys out. This is a shame, as it means that virtually every picture I've taken of Chania now appears in Flickr to have been taken from on top of the lighthouse in the harbour. I've found the interface quite unforgiving at allowing clusters of close photos at that zoom level - it wants to bundle them all together. I've only really attempted to geo-tag pictures from four locations so far. As well as my two recent home towns, I've started working on the photos from two of the locations we visited on our backpacking adventure, Doha and Madrid. I found them difficult for different reasons. 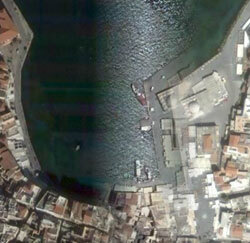 Doha, like Chania, has a very poor quality of map, with very little in the way of zoom. I found the easiest way to locate some of the places was actually to have Google Earth open at the same time, find a place on Google Earth, then zoom that out to the highest resolution Flickr could manage, and plonk my pictures on the Flickr map relative to where I thought the place would be. 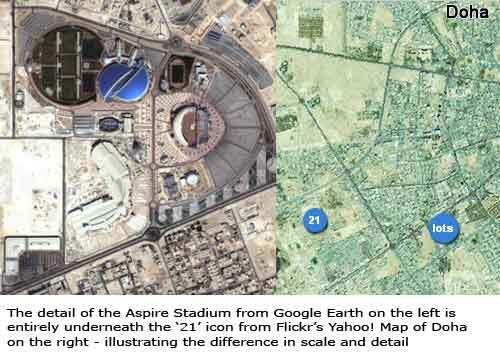 This was particularly disappointing with my photos of the Aspire Stadium. With maps the resolution that Google has managed I would have been able to pinpoint my photographs to exactly the right buildings in the stadium complex. As it is, on Flicker, they are just a fuzzy clump of pictures on top of a fuzzy blur where I think the stadium exists. Of course, that isn't to say Google Earth is perfect all of the time. When you view Chania, the join between two photographs is rather messily placed over the top of the landmark old mosque in Chania harbour. The Doha exercise also begged the question of sometimes where exactly it is best to place the pictures. I have several pictures of Doha's rapidly developing skyline. Should I have placed those photos where the buildings they depict are located, or should I have placed them on the small island in the middle of Doha's bay, where I actually took them? Madrid proved problematic for a host of other reasons - the map was rather more detailed than my hazy memories of some of what we did there. Sure, I was able to pinpoint the exact location of the statue of the fallen angel Lucifer, but what about our night out in the suburbs at a wedding party? We went on to a club afterwards, after lots and lots and lots of free food and drink. I've got absolutely no idea where it was. In the end I've just clumped them together somewhere over the south of Madrid. Likewise there is another batch of photographs of street names and random buildings that I don't know where they are. Again I've made a 'misc' cluster in the centre of town. There is no doubt that I want to put my Madrid photos on a map of Madrid - but I can't help feeling I might have done the same thing as a tourist to London sticking their picture's of West Ham's Upton Park all over Charlton's The Valley ground, because they can see a football stadium in the city from the air, but don't know enough about the geography on the ground. I think I put my Real Madrid photos on top of the right stadium. I think two things would help here. One would be to be able to set a 'vagueness' factor about the location, that could perhaps be represented on the interface by a different coloured icon. 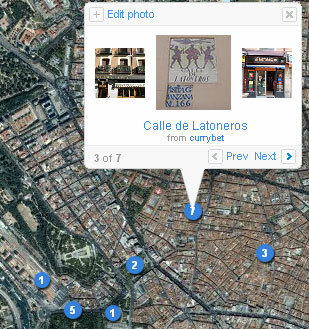 The second would be to be able to see ghost icons of where other people have pinned their photos on the map. There must be lots of people who have already just plonked their Madrid photos in the centre of town - wouldn't it have been good if I could have added my mystery photographs to that clump, rather than, as I guess is the situation that is developing, maps of major cities having a mix of highly accurately placed photographs, alongside a mess of random data. By Martin Belam on 12 September 2006. There's already "vagueness" built in. Place a photo on a map, zoom in 2 or 3 stops, and it disappears from the view. It's not particularly well exposed, but it's not an easy concept to explain. Flickr geotagging interface is brilliant,, but Yahoo Maps coverage for most of the World is very poor. This is a important issue because Flickr's geotagging interface is not designed for accuracy, but for massive geotagging, what it is perfect for some people, but not for others. The concept of "vagueness" is nice, but at the same time is confusing, because it's invisible. In Google Maps you have a much better coverage of the World, in Spain for example even includes street names, a lot of help to recognice the places. If you prefer Google Maps, Panoramio http://www.panoramio.com, may be interesting for you. Btw, you can later watch the photos in Google Earth KML feed - http://www.panoramio.com/panoramio.kml - a much better experience than web based maps.